Warning: This is a super long post…long enough that it seems it keeps crashing my blog when I try to publish it in its entirety. I’ve put in “bookmarks” in case you want to hop directly to an area of interest. In short, I created this entry (which has been broken into 3 pieces) to describe my experience with PTTD, its treatment and my outcome – these ramblings span almost a year, and are all together rather long as a result. I put it together in hopes that others find it useful. Personal history: I used to spend lots of time hiking both on trail and off, as well as doing a fair bit of canyoneering. As I got older and into more sedentary jobs, I struggled with added weight. I used to run, having completed some 5k runs and a half marathon….at the same time, as far as I can remember, I’ve had issues with my knees and ankles. 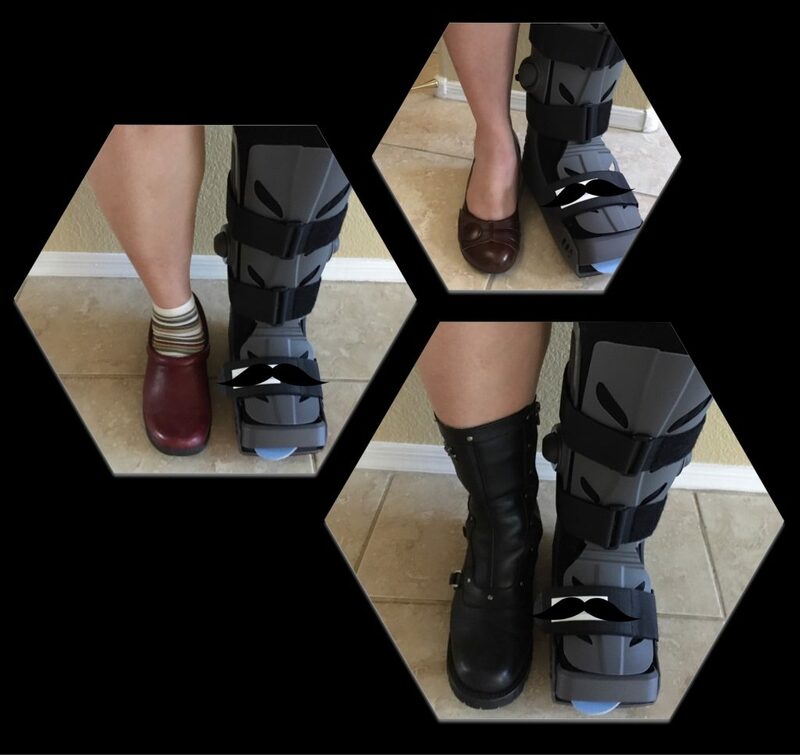 I’ve had custom orthotics for years – probably as far back as 2005 – I have a variety of them, posted and non-posted, full length, and 3/4 length, covered and non-covered. If I think back to my experience with physical therapists I’ve been treated for ankle injuries before, knee issues compounded with IT band problems, severe shin splints and plantar fasciitis….luckily not all on both legs 😉 For me, it seems my left leg has been prone to ankle issues while my right has suffered the brunt of the other injuries including plantar fasciitis, shin splints, a maltracking patella and horrendous IT band tightness. A number of these issues have to do with my body’s biomechanics – I have a lot of slop in my joints and tend to hit the end of my range of motion before I ever feel a stretch to my muscles. So, how did I wind up with all this hardware in my foot? It all started over four years ago – and quite possibly even longer before then, however four years ago I have definitive evidence by way of MRI imaging that I had damaged my posterior tibial tendon. How did I do it? I blame a treadmill, but it could have been any number of things since I tended to do a lot of off trail hiking back then. Interestingly (to me anyhow) my MRI also revealed that indeed seem to have sprained my calcaneofibular and anterior talofibular ligaments. I had also managed to partially tear my deltoid ligament but apparently did it while I was young enough to heal it. Basically, I had evidence in my MRI that I had significantly borked my ankle on both medial and lateral sides previously. Anyhow, four years ago I had suffered some pain on the inside of my ankle and it wasn’t getting any better – I hied myself off to my sports med doc and an MRI was ordered, highlighting a low to intermediate grade interstitial partial tear in my posterior tibial tendon near its insertion point. The recommended treatment course was to get refitted for orthotics, get fitted for a custom ankle brace that restricted lateral movement of my ankle, and complete a round of physical therapy. I did all of the above, and was pain free for about two and a half years. After two and a half years of pain free living, I started getting worsening plantar fasciitis pain and it eventually got bad enough that getting up on my feet after sitting for a while resulted in a limp until I got things warmed back up again. My doctor recommended a round of physical therapy (PT) to treat it – PT helped quite a bit, getting me to the point where I no longer was experiencing plantar fasciitis pain – instead, I was more aware of some nagging pain on the inside of my ankle, where the posterior tibial tendon is located. Sure enough, my physical therapist also observed a fair bit of swelling in that region, and suggested I follow up with my doctor. A followup MRI was ordered and the results were not favorable – the tear that was found previously had not healed and instead was worsening. What does all this mean? The official diagnosis is Posterior Tibial Tendon Dysfunction (PTTD) – also known as Adult Acquired Flat Foot. Strangely enough, I’ve always had fairly flat feet – but the tear in my post tib tendon was causing my left arch to fall and eventually it could have completely collapsed, resulting in arthritis and a significant amount of pain. 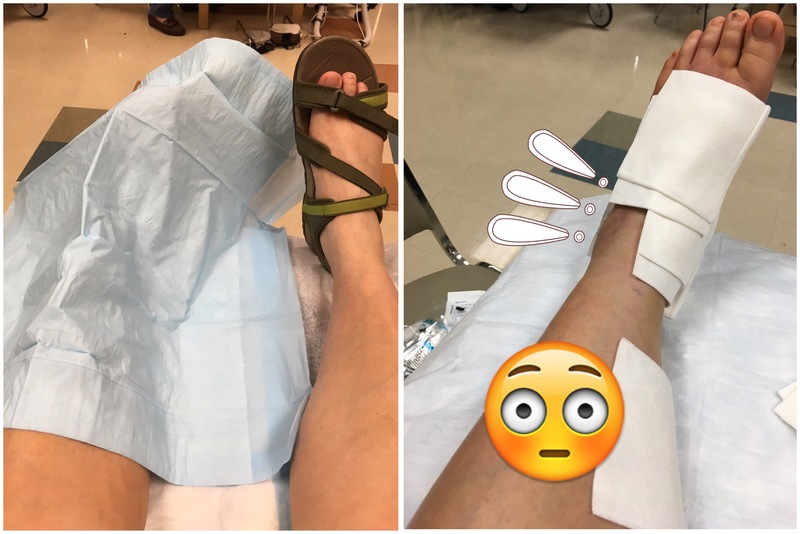 Unfortunately for me, at this point I had exhausted all non invasive treatments and was advised to 1) always wear my ankle brace and 2) start getting opinions from other specialists on treatment. A multitude of specialists were consulted and nearly all agreed on the recommended treatment plan: surgical repair/replacement of the tendon and rebuilding the arch of my affected foot. One doctor suggested one additional minimally invasive treatment (Platelet Rich Plasma (PRP) injection therapy) prior to trying surgery, however PRP is not an approved treatment in the US, and I could not find any significant literature on it for injuries of my type. In addition, recovery would have involved being in a walking boot for 6 weeks and if the injury was not repaired, I would have to go down the path of surgery anyway. As you’ve likely surmised, I opted for surgery. 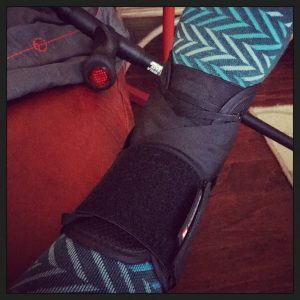 I wore my brace daily until surgery to try to minimize any further damage to the tendon, however it seems the tendon in question was so badly damaged that they did not repair it, but removed it altogether. What all is involved in the surgery? In medical terms, it included the following: medial slide calcaneal osteotomy, lateral column lengthening, TMT fusion, Flexor Digitorum Longus transfer and spring ligament repair, and gastroc recession. In laymen’s terms: they cut my heel in 2 places, moved it over towards the center of my body, added some length to it and screwed it in place; fused my first metatarsal joint (the joint was hypermobile and was allowing my arch to collapse – without fusing it I risk damaging the transferred tendon); the damaged post tib tendon was removed and the flexor digitorum longus was transferred to act in its place; my calf muscle was released/lengthened to accommodate the new position of my heel and to not yank on the newly transferred tendon. All of this resulted in six incisions, eight screws, one plate, a bone shim from a cadaver’s illiac crest and a whole lot of stitches. trust me, it was gruesome. The surgery itself took about two and a half hours to complete – I was out under general anesthesia in addition to a popliteal nerve block. There was an option for this to be an outpatient treatment, however I was admitted overnight for monitoring because I did not take to the anesthesia well at all – I suffered severe nausea well into the early morning hours after the surgery, and it took several different antiemetics to get things under control. Similarly, I apparently don’t tolerate prescription pain killers terribly well either, as those also left me with nausea, requiring regular doses of phenergan (which basically worked as an antiemetic by knocking me out). I weaned myself off the prescription pain medications in less than a week after the surgery, and continued to manage the pain over the next few weeks using ibuprofen, aspirin and acetaminophen (cutting back to only aspirin and ibuprofen as the pain reduced). Other than the nausea, which I knew to expect, another side effect of the anesthesia and/or post surgery medications was general brain fog and a complete inability to concentrate. I had thought that since I was going to be immobile and on the couch with my leg elevated to heart level that I was going to to need to make sure to have lots of things near by to keep me occupied – I pre-prepped piles of reading material, yarn crafts and hand sewing projects. In reality, for the first I was only able to work on a very simple (and ultimately mindless) blanket project which had been in hibernation for years (due mostly in part to how non-engaging and repetitive a project it was). At around the 3.5 – 4 week point, the fog started to clear…timing wise this was just about perfect as I finally got the blanket done to an appropriate size to finish it off (and was starting to get bored with it again)! 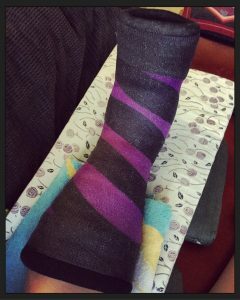 First cast – a purple and black glittery affair, colors selected in honor of all the bruising present on my foot post surgery. 0-1 week after surgery: Leg was wrapped in surgical dressing and splint. Foot/Ankle was elevated to heart level or higher to promote healing and reduce swelling. Bathing was done by supporting the splint outside the bathtub, while using a pitcher to pour water over myself – I didn’t want to try to get a cast cover on over the soft dressing so resorted to this method of bathing. If not obvious, my leg was non-weight bearing (NWB) during this time. 1 Week after surgery: Post surgical soft dressing and splint was removed, incisions inspected and I was put into a cast. I’ve never had a cast before, and wasn’t sure what to expect – I was surprised to discover I had a palette to select from (including a glow in the dark option!). Foot was remarkably bruised and swollen, but I was assured that it was the appropriate level of gruesome given what all was done to it during the surgery. 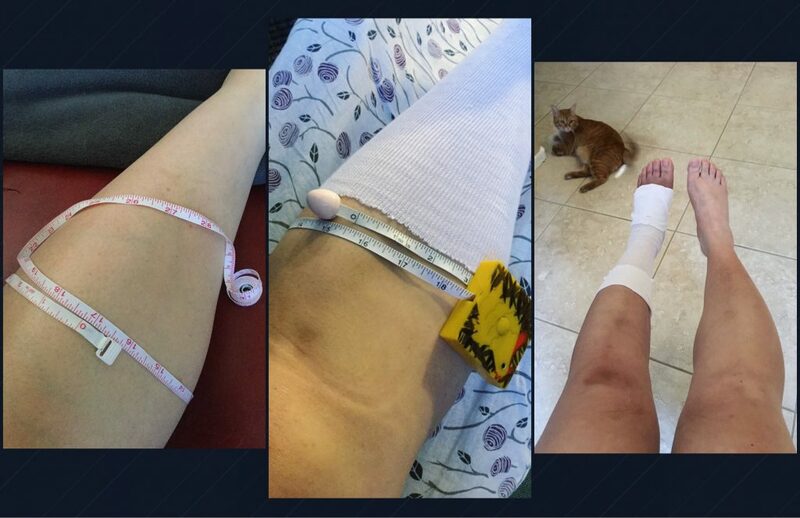 1-3 weeks after surgery: Continued to elevate leg at or above heart level, for the most part, remained benched with no excursions out of the house to speak of (still NWB). Towards the latter portion of this timeframe, my leg started to itch inside the cast – it is not advised to put things inside the cast, but luckily for me, my leg had atrophied/reduced swelling enough that I could reach my hand in from the top of the cast to get a bit of relief. 3 weeks after surgery: Stitches removed, steri-strips and new cast applied (red and black with glitter). There was still a surprising amount of swelling and bruising, though I was assured that that was completely normal. I brought some old washcloths and no-rinse bath wash with me to my appointment so I could try to clean my leg somewhat since it had been locked up in a dressing or cast for the previous 3 weeks. It was good to scrub off some of the marker and iodine that was put on the leg during the course of the surgery, and in general it was good to get the sweat off of it. 3-6 weeks after surgery: Longer bouts with the leg not elevated, though for all intents and purposes I was still couch bound with my leg elevated at/above heart level and still NWB. Unfortunately, my ankle started to itch more regularly with this cast – likely a combination of the healing process and slight dampness. I had been advised that a vacuum could help relieve itching. 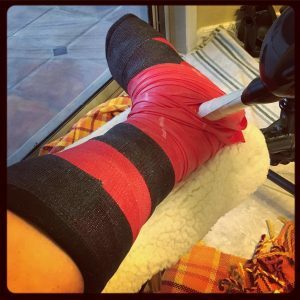 There is even a commercial product out there that uses a vinyl band and a vacuum port to help cool down a cast – I wasn’t super thrilled with the asking price, so I had a look at what I had available to me at home – my solution involved an old theraband (that red wrapped around the ankle of the cast) and a toilet paper tube. I cut the tube to make sure I could get it to fit tightly around the hose of my vacuum, and also cut fins or flaps into one end of the tube, opening them outward and securing them on the inside of the theraband to ensure a good seal – this helped with the itching somewhat, and had I used my shop vac, I would have been able to draw more air through. The theraband and toilet paper tube help to really localize the suction from the vacuum – pulling cooler ambient air through the cast surprisingly (to me) help reduce the itching. 6 weeks after surgery: Cast Removed! My foot was still remarkably purple and bruised, and my calf was significantly atrophied (and very flabby and spongy in texture). Overall in six weeks, my calf shrank by about two inches at its largest point. The incisions, for the most part, were healed – with the exception of the one on the very top of my foot (where the plate went in) – that one still had a little bit to go, so they steri-stripped it. Lest you think I was turned loose at this point with no more hardware, I was issued a walking boot, a soft plantar fasciitis night splint, a PT prescription, a recommendation for over the counter arch support for use inside the walking boot (I went with a superfeet blue insert – I’ll have to see with time if I should have gone with the green instead) and was told to transition to partial weight bearing on the surgical foot with the goal of getting to full weight bearing over the next couple weeks. One thing that no one really mentioned was just how much skin was going to be sloughing off once the cast was removed. Since I still had one incision that wasn’t fully healed, I was advised to not soak the leg (showering was fine but immersing it in a tub for a long period of time was not recommended). To facilitate exfoliation, I wrapped my lower leg and foot in a damp towel (except the incision that was steri-stripped) and then used a combination of a washcloth and pumice sponge to help remove the dead skin. I also liberally applied moisturizer and wore a sock. Whenever my skin or healed incisions got itchy I tried not to scratch, but would sometimes dry brush, apply cortisone cream or apply an ice pack to relieve the itching. Over the weekend, I started hobbling around on my crutches while starting to put weight on my foot – I have to admit, crutching while partial weight bearing was significantly easier than crutching while non weight bearing…even if I wasn’t putting much weight down on my foot, it was easier than holding it up off the ground completely. The goal was to gradually increase the % of my bodyweight being put on the foot to about 50% over the course of the following week. Physical therapy started bright and early the Monday after the cast was removed. Range of motion in my ankle had reduced to nearly nothing. Initial exercises assigned were for active range of motion in the ankle (including flexion, extension, inversion and eversion), small foot muscles (arch raises and toe yoga) and I was reintroduced to the BAPS board – because my range of motion had been so significantly reduced, successfully using the BAPS board even on its smallest setting was a challenge. Additional exercises were also assigned for my quads, hamstrings, hips and core – mostly to try to get things back in shape after not being used properly for 6+ weeks. 7 weeks post surgery: Remaining Steri strips were removed from the incision on the top of my foot. Physical therapy continues, continuing to work active range of motion in ankle while also receiving manual treatment on scar tissue and muscles as they start to be more engaged with walking. Cleared to attempt 1 crutch walking to facilitate transition to full weight bearing over the course of the following week. One thing they don’t warn you about while being stuck with a walking boot, is that the sole is quite tall – finding footwear that matches for heel height is a bit of a challenge. It seems for me, my best bet is my danskos with a custom orthotic and heel lift inside or my old moto boot. Transitioning to walking on a single crutch was not too difficult, though I do note discomfort under my heel and sometimes on the outside of my foot – I suspect these are both related to scar tissue and continued healing of the calcaneus. 8 weeks post surgery: By the beginning of the 8th week post surgery, I have successfully transitioned to full weight bearing on occasion but still assisted with single crutch in the morning, or if the distance is significant or if experiencing a pain flare up. Most bruising and discoloration has finally faded, though there is still some swelling compared to my other foot. Ankle flexion and extension range of motion significantly improved, though significant tightness is now appearing in foot, and lower leg (calf and shin) as use is increased. Biggest concern is overuse resulting in tendinitis – have been advised to not rush into walking too much if it is resulting in significant pain which will slow or stall progress. Exercises remain non-weight/resistance bearing though I have added calf stretches and seated heel and toe raises while also progressing to the next level on the BAPS board. 9 weeks post surgery: I still notice swelling and discoloration when compared to my other foot/leg. By the beginning of the 9th week post surgery, I am consistently making my way around without the aid of a crutch and have been cleared to stand still on both feet to start working on proprioception and start getting the muscles in my foot to realize the vacation is over. (My foot is still confined in a walking boot during the day and a splint at night.) I’m also continuing with active range of motion exercises, adding ankle circles and alphabet drawing. I’ve also managed to advance to the middle sized hemisphere on the BAPS board! Standing on the surgical foot has been a strange experience – the floor usually feels much cooler to that foot (due to the difference in blood flow between my feet, I suspect) – and it often feels like there is something strange going on beneath my heel (other than the 2 monstrous screws that were inserted). I suspect this has to do with heel tissue atrophy while I was nonweight bearing combined with scar tissue and general numbness in certain regions due to surgically induced nerve damage that has yet to repair itself. 10 weeks post surgery: Graduated out of the walking boot and into a sturdy shoe and ankle brace (and also cleared from the night splint)! During my check-up I had to take a few steps without boot or brace to get weight bearing x-rays done and I have to say, my ankle is really really weak. As you may have surmised from the photo, I have taken up the crutch again while I make the transition into the ankle brace and shoes. The goal over the next month will be to eventually transition out of the ankle brace and into a supportive shoe. As you might guess, the brace is somewhat bulky, necessitating a trial of shoes again to accommodate. Unlike my rigid brace this one adds bulk to my midfoot (on top of the swelling that is also present). 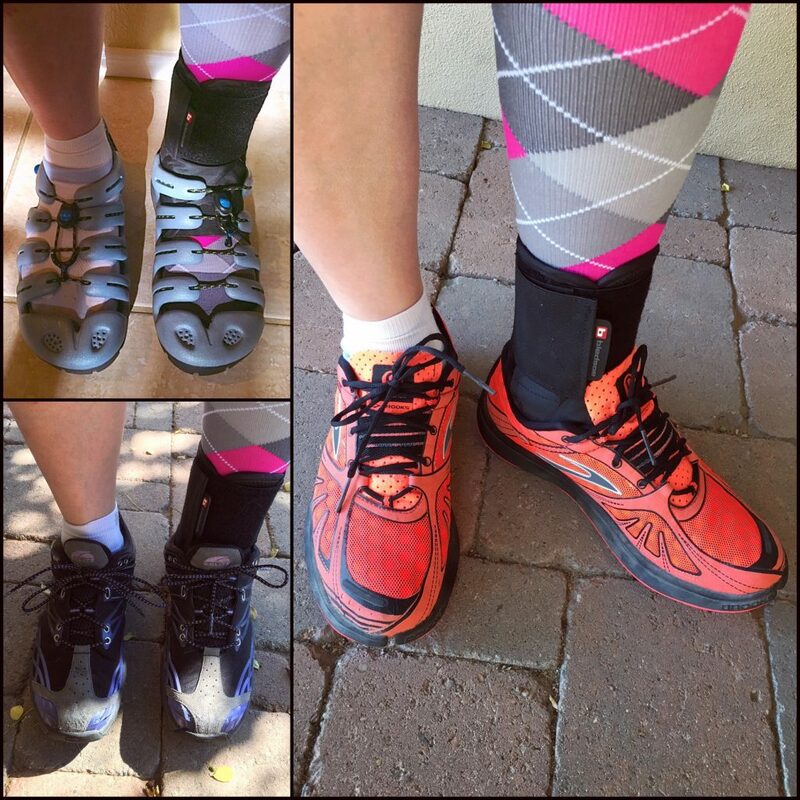 In addition, since I had my calf lengthened during the surgery, I have also been encouraged to find a pair of supportive zero-drop shoes to help encourage my calf to stay lengthened and also to help strengthen my feet. Normally transitioning to a zero-drop shoe takes some time, however relearning how to walk after two months of not walking makes some things a bit easier….my walking gait is actually rather screwed up right now since I picked up some bad habits while in the walking boot that result in a lurching and swaying gait. I auditioned all the shoes in my closet to check for fit and to try to select a pair for in house and out-of-house use. Starting in the lower left, my black trail runners fit, but they have a considerable ramp height from heel to toe – so I ruled them out. In the upper left, I have a pair of weird looking rubbery shoes (made by a company that is no longer in business) – they are sturdy and easy to slip on and off, but they also have a fairly significant heel-toe drop (it seems most “flats” actually have a 10-15mm drop) – they will do for house shoes until I secure some zero-drop shoes to press into service. The closest shoe I have to a zero drop shoe are the bright orange brooks – these have been languishing in my closet for some time due to injury and other things (I think the current model of this shoe is on it’s 5th generation) – they have a 4mm drop – unfortunately, due to swelling in my foot, they are rather uncomfortable through the midfoot. After pinging various running friends I settled on a brand I had heard of, but had not tried: Altra. Altra makes a line of cushioned zero drop shoes (and there are many brands that make low drop shoes in the 4mm range) One of the things I like best about the Altras though is the wide toe box, which accommodate my feet nicely without any pressure on my toes – it’s the same reason I like Keens so much. 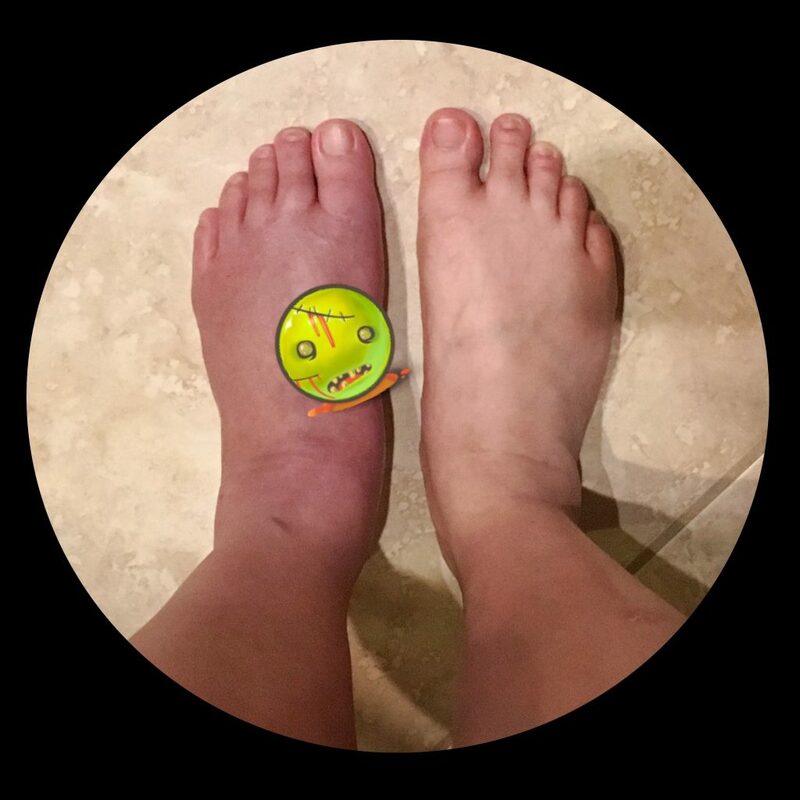 As for progress and pain, my range of motion is coming back, though I feel some pain in the ankle joint as I have started to use it again – I suspect this is the ligaments getting re-accustomed to being pressed into service. At 10 weeks, I still have not started active strengthening exercises, but have been adding some additional proprioception exercises (with shoes on) to help retrain my gait. Over the next few weeks, I expect to add some light resistance to my exercises by way of a theraband (starting with yellow). Weeks 11 & 12 post surgery: I’m officially back to work and my foot is officially cranky about the situation and generally displays a fair bit of inflammation by the end of the day (and some pretty spectacular purpling too). As a result, I’ve not yet completely abandoned the crutch, though I try to walk around in the office area without it. My gait continues to be “strange” and requires conscious effort to be remotely balanced, and I still tend to strike on the outside of my surgery foot and have a hard time getting over onto the big-toe / first metatarsal side of the ball of my foot when toeing off. I’ve been wearing two different kind of Altras – I have a pair of house shoes (Altra Superior 2 – they are actually trail runners, but with “light cushioning”) – for out of the house, I have been wearing Altra Provision 2.5s with “moderate cushioning”. The Provision is a “guidance” or stability shoe – and lately I’ve noticed that it feels like it might be working against me as far as my getting my gait in order with a proper toe-off – so I’ve switched to the Intuition 3.5, which is a neutral gait “moderate cushioned” shoe (also made by Altra). Interestingly, I think I could actually feel the stability wedge at work in the Provisions when I put them on after changing out from the Superiors in the morning. Hopefully the Intuition gets me on the right track for my gait. Weeks 13 & 14 post surgery: Shoe news: the Altra Intuitions definitely feel more level and my gait is slowly getting better. I’ve been cleared to stop using the ankle brace and have started adding some additional exercises to increase ankle mobility as well as start working on strength/stability. Resistance/theraband exercises have been assigned (flexion, extension, inversion and eversion) using the yellow theraband in addition to some single leg balance exercises and heel-toe walking. I definitely still don’t load the foot properly and have difficulty getting weight down through the forefoot – it’s especially obvious when either standing on a foam balance pad or a balance disk. I’m still working on waking up all the muscles in my foot to correct this. Crutch/Cane update: Since returning to work, I have been carrying 1 crutch in for use – often I am able to go short distances/periods unassisted. At home, I generally get around without any crutch or cane assistance. Gait is smoothing out and getting to be more normal, though I still have to actively think about foot strike and transition through for toe-off. I had PTTD surgery Febuary 7th and I just wanted to let you know how much your words have not only encouraged me but also helped me through times when I thought I as at the end of my rope! Thank you so very much for putting this all into words and experiences I can understand and helping me through one of the most difficult times of my life!!!! Hi Tabitha, If you could go into the past, and Not have the surgery…would you opt out? I am at the threshold of getting the surgery after 7 long years of challenges with it. So, just wondering…. Thank you very much. Also, I am wondering if there is Anyone out there that someone knows…that had the operation YEARS ago, and is having success? I hear a lot about the first year, but what about 5-10 years out? Thank you. Thank you very much for this. It was very detailed and informative. How are you today? Like, almost one year, and how are you doing and feeling? Thank you for your reply. I think I need surgery, and am trying to find alternatives, even after 7 years injury. Thank you for your time. Thank you for sharing your experience. I have had a total knee replacement and have been told this surgery is worse. I have been moved from a position where I walked 8-10 miles a day, 4 days a week for work, to a desk position. Surgery is inevitable but when is the question. We have a 16 day trip to Alaska in August then a 4 day trip to Disney World in November. May try to wait until Jan 2019, but will see following Alaska. Again, thank you. Oh, and if you have a brace, i recommend using that in the meantime. The summer before my surgery, i had some travel with significant walking and hiking. I managed my pain with ibuprofen, ice and the brace. Thanks Stephanie. I can’t go without my brace other than short walks around the house and to cut the grass, since it is still hot here and it would stink. Looks like surgery will be late November/early December. Alaska trip went well but lots of swelling. No dress shoes at all. I was so glad to see this information and appreciate it so much. I had surgery last Wednesday and have been home from the hospital for two days. I do a little more every day than I thought was possible (ie when I left hospital, I was doubtful I would ever be able to get up and use the potty chair!) But somehow, I did it! I know this is going to be a long recovery and I’m prepared for that (sort of). Long for the day I can walk through the grocery store without popping extra Tylenol’s and prescription meds. I’m so sorry – I somehow managed to miss this comment! I hope you have been healing well and are on your way to a full recovery! I am just beginning to look into surgery for my PTTD, having exhausted all conservative interventions. It really gives me some idea of what to potentially expect and gives my family an idea of what the recovery period might be like. Really appreciate that you took the time to write it all down. Hello Yasmin, sorry I completely missed this comment – I’m glad my lengthy post was helpful to you and your family, and I hope you are well. Kind Regards! My story leading up to the surgery is pretty much the same as yours! This is so helpful. I am looking at the surgery next fall, after I retire and can be home and recover. How are you doing now? Hi Robin, I hope your surgery is successful and that you are able to manage in the meantime. I am doing fairly well – I can hike, though I’m definitely not conditioned for off trail hiking – though I don’t get out as much as I did pre surgery (that’s work and lack of energy thanks to work mostly). Do take the time to interview your surgeons and select one you feel confident in! what is the outlook on returning to running and hiking? I have been in pain for the last year or so. I miss running. I can’t even do beachbody workouts without pain. I have had to severely cut back on cycling too. I really want to return to my active lifestyle. bracing hasn’t helped. The brace and most shoes rub the tendon and make the pain worse. 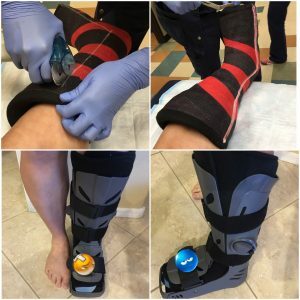 I’ve gone through PT and custom orthotics as well. My doctor has suggested surgery, but reading people’s experiences it seems so extreme. And I worry that I may never be able to be active again, and that doing the surgery is likely a surefire way to ensure that I never can be active again. For me, bracing was barely tolerable and very restrictive. I’m able to hike, and with enough time and conditioning, I suspect I’d be able to get back to the level of hiking I was doing before (long days/miles offtrail) – I definitely have to watch it more with off trail hiking now (and my foot doesn’t tolerate super long days). I haven’t run in years, but that’s more because I also have a maltracking patella that has been chewing away cartilage. The biggest thing with the recovery is making sure to take it slowly to prevent reinjury and to allow the body to re-strengthen – especially for the tendon repair/replacement. It may be worth talking to several Surgeons and highlighting your concerns to them and see what their response is. My surgeon was very clear that I should be able to return to my active lifestyle but it would take time and I would need to learn to pay attention to my body to make sure I don’t push things too far and risk reinjury. Thank you for your story. I am 63. I have had custom orthotics for about 18 years. 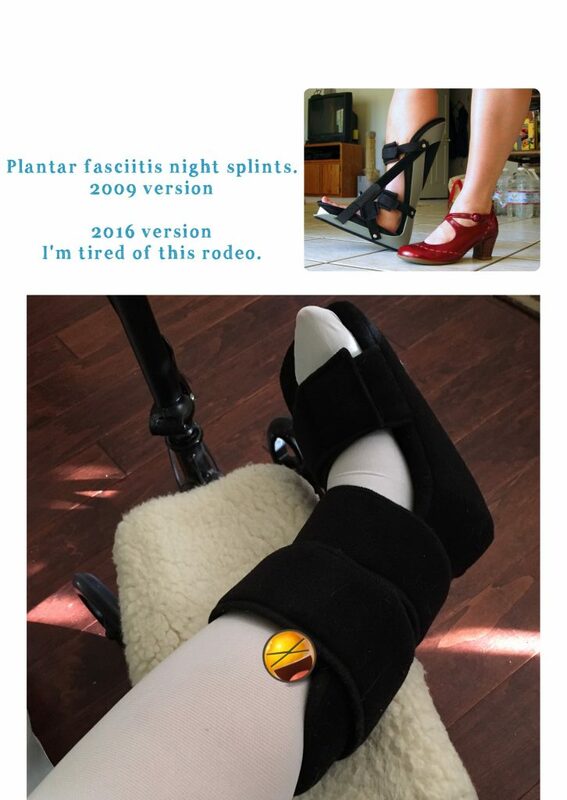 Five years ago I was prescribed an AFO brace for my left foot because of PTTD. I saw my orthopedic surgeon today and he recommends surgery. He has been my surgeon for all of these years. I am so reluctant because of the recovery and because of my age. He said I will need it within 5 years because of the possibility of developing arthritis. In five years I will be 68. I am fairly sedentary. Just grocery shopping. Walking longer than an hour causes pain. Even in my orthotic and AFO boot. I am glad to read your experience. I do t know if the surgery is worth it. I need to think long and hard. Maybe when my husband retires in a year and a half so he can help me. Lots to think about. I am glad I am not alone. Michelle, I’m glad my post has been helpful to you, and I hope it better helps you understand what is involved. Thank you so much for your very informative post. I am 67 years old and was in the best shape of my life when I tore my posterior tibial tendon. I am 12 days post surgery. I read your post thoroughly and came away with the most important part, for me,is not to rush it and be patient. Was it painful after the surgery? Yes. Do I want my life back? Yes. Would I do it again? Yes. Your post has been a valuable service for all of us looking for answers and insights into posterior tibial tendon surgery. Sherri, I’m glad my post has proven helpful. I wish you swift healing! I just returned from another hiking vacation – the foot did remarkably well, considering nearly all the hiking was of the off trail variety!